Geraint Thomas is riding well enough to lead Team Sky in one of next season's Grand Tours, says former professional cyclist Magnus Backstedt. 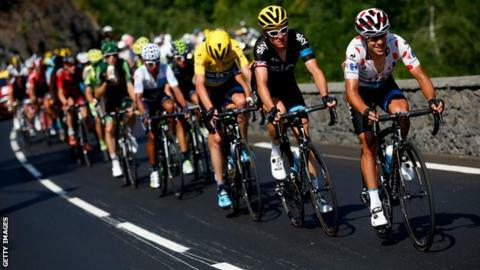 Chris Froome is Team Sky's number one and currently leads the Tour de France, with Welshman Thomas fifth overall. But Thomas could lead Sky in the Giro d'Italia or Vuelta a Espana next year. "With Richie Porte rumoured to be moving out of Team Sky for next year I think we potentially have another Grand Tour contender," Backstedt said. "Certainly he's [Thomas] someone that [Team Sky principal] Sir Dave Brailsford is looking at for the Giro or Vuelta and have a crack at it." Froome holds an impressive lead of two minutes and 52 seconds over nearest challenger Tejay van Garderen after Wednesday's 11th stage from Pau to Cauterets. Thomas is four minutes three seconds behind his team leader, ahead of riders such as Alberto Contador and Vincenzo Nibali who were expected to be some of Froome's main challengers. While Froome is likely to remain Team Sky leader for the flagship 21-stage Tour de France, Thomas could be given the job in one of the other gruelling blue riband races. The 2015 Giro d'Italia and Vuelta a Espana also have 21 stages. Backstedt, who retired as a pro cyclist in 2013 but continues to compete in triathlon and Ironman Triathlon events, has been impressed with Thomas' progress. "He's moved forward dramatically, especially in the mountains, he's really worked hard and improved," the Swede told BBC Radio Wales Sport. "It's been an improvement over quite a period of time; we saw last year he was riding well in the mountains but maybe not as well as he has this year. "Even early on in the season he was showing signs of brilliance up in the bigger mountains and as time has gone on this season he's just got better and better. "Right now he's at his peak fitness and he's riding incredibly strong."